One would think that a rainbow-colored mountain would be fairly easy to spot, but in the case of Vinicunca, set high in the Peruvian Andes, getting a view of the multihued wonder means waking up early to trek through mountains that burst with natural colors, but are thin on air considering they rise over 17,000 feet (5181m). Despite the physical challenges, however, seeing Vinicunca in person is a once-in-a-lifetime visual treat where you’ll likely find yourself gawking in silence and wondering, “how is this real?” With impressively straight and colorful lines, “Rainbow Mountain,” as it’s come to be known, explodes with hues of lavender and red that are caused by minerals in the soil, and looks like something from a coloring book as opposed to an actual Andean peak that few are lucky to see. Insider's Tip: Be sure to pack clothes for all types of weather, as snow, ice, hail, rain, and searing sun are all possible in the span of a few hours. Also be sure to wear hiking boots, since steep sections of trail can become very slippery if there’s been any rain or snow. The best season for trekking near Cuzco is from April through October when it’s a bit colder, but the weather is much drier. To see Rainbow Mountain, you can either choose from a 6-day trek on the remote Ausangate Trail, or do an abbreviated, 1-day trek that departs from Cuzco around 3am and offers a view of Vinicunca on a challenging, but attainable trail. Because of the very high altitude, however, hikers should be in relatively good health and already acclimatized to the altitude. Challenge yourself and get a great payoff on this 16-hour day trip to Rainbow Mountain (Vinicunca Mountain) from Cusco. 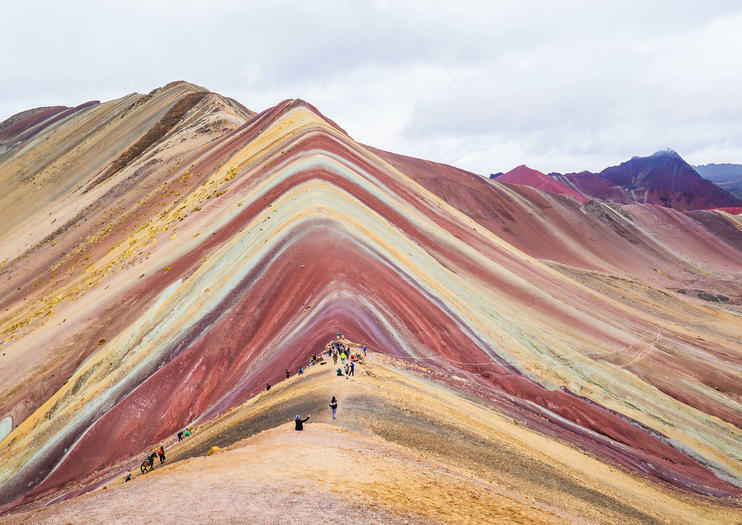 This little-known spot in Peru is not only a must-see because of its naturally colorful mountains, but it’s the perfect location to take trip pics. Go on an exciting 3- to 4-hour hike to make your way to where the mountains are. Plus, enjoy breakfast, snacks, lunch, and round-trip transport on this trip. Despite receiving less attention than its more popular northern counterpart, Cusco’s southern valley contains its very own array of wondrous and impressive attractions. This end of the valley is irrigated by the Willkamayu River, which means sacred river in Quechua. Today, the river is better known as the Vilcanota or Urubamba, a powerful waterway that eventually turns into the Ucayali River, before travelling down into the jungle and giving way to the great Amazon River. The waters of this sacred river come from the Vilcanota Mountain range, some of the mountains in Peru that receive the most snow, and reach a maximum height of 6,372 meters above sea level with the revered Ausangate Mountain.